Providing you the best range of slot insulation paper inserting machine and slot cell insulation paper inserting machine with effective & timely delivery. Backed by our sound reputation as established manufacturers and suppliers of an impressive array of machines we are offering Slot Insulation Paper Inserting Machine. It is precisely manufactured by using the finest grades of components that are procured from reputed vendors of the industry. We follow rigid norms of quality by ensuring strict adherence to well defined norms of the domain and offer this at reasonable rates to our valued patrons. 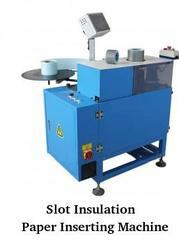 This machine is specially designed for slot cell paper insertion of medium and small size stator. All procedure are done by the machine automatically except to put on and take off stator. The complete inserting time for 24 slots can be shorten to 12sec/stator. The production cost will be highly reduced by decreasing the material loss and labor cost. 1. High insertion speed (about to 0.5 sec/slot), labor saving, cost reduction, and stable quality output. 2. Easy adjustment while changing stack height of stator or width of insulating paper. 3. Change tooling design to meet different shape of stator slots. Looking for Slot Insulation Paper Inserting Machine ?